Background: Women's health is a key factor affecting the health of the whole population. Tackling inequality in determinants of health is recognized as the main path toward reducing the inequality in health outcomes. This study aimed to analyze the provincial inequality in determinants of women's health and health care in Iran. Methods: Using the Moss's model (2002) as a comprehensive framework of determinants of women's health, including “geopolitical environment,” “culture, norms, sanctions,” “women's roles in reproduction and production,” “health-related mediators,” and “health outcome” categories, we chose 13 indicators. Afterward, using data sources including the Iranian Multiple Indicators of Demographics and Health Survey, the National Organization for Civil Registration, and Statistics Centre of Iran, we analyzed provincial inequality in these indicators in Iran (2011). Gini coefficient and Lorenz curve were used for measuring inequality. Results: Gini coefficients calculated as follows; life satisfaction level (0.027), literate women (0.398), women with proper knowledge about HIV/AIDS prevention (0.483), unemployed women (0.380), women without an income (0.384), women who use at least one type of mass media (0.389), women who used computer or internet (0.467), women who had received pregnancy care from a skill birth attendant (SBA) (0.420), women who had delivered with the help of an SBA (0.426), women who currently smoke cigarettes (0.603), women who currently consume hookah (0.561), women with at least one chronic disease (0.438), and women's deaths in 2010 and 2011 (0.393 and 0.359, respectively). Conclusions: We found large provincial disparities in determinants of women's health in Iran. Determinants such as lifestyle, health behavior, health knowledge, and health-care services availability should be considered by health policymakers in addressing the inequality in women's health at a provincial level. Women are considered one of the most important population groups, who play a key role in the social and economic development of any country. For this reason, addressing the health needs of women can stimulate better health of society. However, women and men stand in a position of unequal power, and this issue results in the poor socioeconomic status of women and makes them more susceptible to poor health. Today, addressing women's health is considered one of the high priority issues in public health of all countries, particularly low- and middle-income countries. Hence, the determinants of women's health and planning new interventions and policies for improving them are pivotal for health policymakers. Considering the different and diverse factors affecting women's health outcomes across cultures and nations, Moss has explained a comprehensive and unified framework which encompasses a wide range of determinants for the patterning of women's health. Since this framework contains both determinants of women's health at micro- and macro-levels among different communities, it may lead to better understanding the current situation of women's health determinants, to promote equity, equality, and well-being. Notwithstanding addressing women's health in policy making of Iran in recent years, there are few published studies and comprehensive evidence of disparities in determinants of health among Iranian women. The present study aimed to measure geographical disparities in some health outcomes and health mediators within and without the healthcare system among Iranian women aged 15–24 and 15–54 years. Demographic and health surveys (DHSs) provide valuable data on health and the population at the national and regional levels for assessing a range of indicators. Many studies in public health area, especially on children , and women's health,,,,, have used DHS data. Inequality and disparity measurement in women's health is one secondary use of these data. However, most previous studies of inequality in women's health, particularly in low- and middle-income countries, were mainly focused on single or limited indicators and less based on diverse and multiple indicators of health-related factors.,,,,,,, For this reason, the present study includes two distinctions as compared with previous studies. First, we assess the disparity in various factors related to women's health at the provincial level. Second, we also present the disparity of indicators based on a theoretical framework of the patterning of women's health in a developing country. Use of this framework adds some value to better understanding of the interrelationship of factors in influencing women's health. Therefore, our study provides a framework for women's health inequality measurement based on DHS data, especially in developing countries. We used a conceptual framework based on the Moss's study  for categorizing and better understanding of the social determinants of women's health. This framework categorizes the determinants of women's health into five areas as follows: geopolitical environment; women's roles in reproduction and production; culture, norms, and sanctions; health-related mediators; and health outcomes. Every category includes some subcategories and each subcategory includes several factors. In the current study, a few variables were selected for measuring inequality in women's health based on data availability and Moss's framework. Therefore, we limited our analysis to a few factors in Moss's framework. Our selected variables, their category and subcategory, and their definition are presented in [Table 1]. We used three data sources for measuring geographical disparities and inequalities, including the Iranian Multiple Indicators of Demographics and Health Survey (IrMIDHS),, crude death data of the National Organization for Civil Registration (NOCR), and Census 2011 of Statistics Centre of Iran (SCI). The main data source of our study was IrMIDHS. It was a cross-sectional, multistage stratified cluster random survey carried out using face-to-face household interviews aiming to estimate various demographic and health indicators in 31 provinces in Iran. This survey was conducted during 2010–2011 among proportional samples of the population size in each district within each province. Furthermore, the samples were selected from rural and urban areas in each district. In total, a sample of 30,960 households (2187 urban vs. 909 rural) was included in IrMIDHS. A total of 35,305 females between 15 and 54 years participated in the study. In our study, the data on females were analyzed at the aggregate level of each province. Values of variables in IrMIDHS were reported mostly in percentage or rate scales. However, to measure inequality, we also needed the crude and absolute values of variables. Hence, we used a crude number of the women's total population per age groups and province that was extracted from Census 2011 of SCI for calculating the actual absolute values of variables. To analyze the inequality in a health outcome, i.e., mortality, we also used crude death rate for women obtained from NOCR in 2010 and 2011. The Gini coefficient is used for measuring several aspects of health inequities, through comparisons between different levels of geographic categorization, including local, county, and state levels among different population groups.,,, For this reason, Gini coefficient and Lorenz curve were used for measuring inequality in women's health. The Lorenz curve is a cumulative measure of inequality that indicates distribution of a variable graphically. 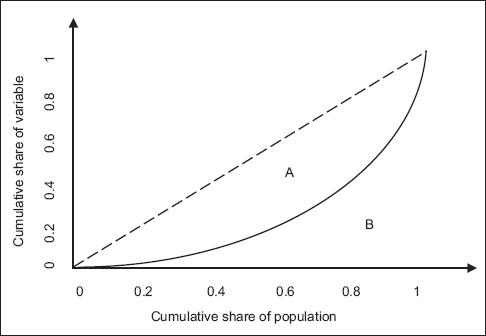 As shown in [Figure 1], the cumulative share of population when the different provinces are ranked by greatest amount of disadvantages to the greatest amount of advantages value of variable (X-axis), against the cumulative share of variable (Y-axis). The diagonal (45°) line represents perfect equality of the variable in the population and the curve shows departures from perfect equality. The Gini coefficient is another measure of inequality at the aggregate level that is derived from the Lorenz curve. The Gini coefficient is equal to the area between the Lorenz curve and the diagonal line, divided by the triangle below the equality line . It takes values between 0 (perfect equality) and 1 (maximum amount of inequality) [Figure 1]. In the above equation, Yi, Xi, and k show the cumulative share of variable in the ith province, cumulative share of population in the ith province, and total number of province. For every variable, the Lorenz curve, Gini coefficient, and their confidence interval were estimated. Before reporting the comparative results, it would be useful to have a look at general status of women's health in Iran. Crude death rate for women was 2.8 (per 1000). About 20% of women aged 15–54 years suffer from at least one chronic disease (skin diseases, diabetes, asthma, cardiovascular, and joint diseases). The literacy rate for young women (15–25 years of age) was 96.83%; this rate was 80.07% in women over 6 years old. Almost 96% of deliveries were conducted by a skilled birth attendant (SBA). Findings showed that of the 31 provinces, Sistan and Balouchestan had the lowest value in terms of most indices, including welfare, education, and health-related mediator factors. However, the highest values of indices were related to different provinces (e.g., Ardebil, Markazi, Yazd, Lorestan, and Zanjan). Of the studied indices, the most difference between the highest and the lowest values was related to crude women's mortality (standard deviation [SD] =6334 and 5189 in 2010 and 2011, respectively), the percentage of women who use computer or internet (SD = 12.49), the percentage of women with proper knowledge on HIV/AIDS (SD = 7.29), the percentage of women with at least one chronic disease (SD = 6.56), and the percentage of literate women (SD = 6.26), respectively [Table 1]. It should be asserted that life satisfaction level for women aged 15–24 years (in geopolitical environment/welfare category) had a Likert scale (1 = most to 5 = least satisfaction level). In other words, a higher score of the index shows a lower life satisfaction. The Lorenz curve and estimated Gini coefficient for 13 variables in five main categories are shown in [Figure 2],[Figure 3],[Figure 4],[Figure 5],[Figure 6]. This study examined the geographical disparities in multiple health determinants and outcomes of women's health based on Moss's framework in Iran. It is the first comprehensive attempt to describe and measure provincial inequality in the health of Iranian women. The findings of descriptive statistics and the Gini coefficient showed that there are different levels of disparity in the different determinants of women's health across the provinces. Results of provincial disparity for every factor will be indicated as follows. Our study showed that the largest provincial disparity was related to “women aged 15–54 years who currently smoke cigarettes,” followed by “women aged 15–24 years who currently consume hookah” and “women aged 15–54 years with proper knowledge about HIV/AIDS prevention.” The least disparity was related to “level of life satisfaction in women.” Extra explanation on mentioned findings is presented later. In the geopolitical environment category, disparity in the level of life satisfaction was assessed. Related findings showed that women in all provinces have approximately equal life satisfaction. However, part of this equality could be attributed to the fact that the feeling of life satisfaction mainly depends on people's perspective on their life not to their living conditions and socioeconomic status. In the culture, norms, and sanctions category, results demonstrated large disparity for literate women aged 15–24 years and women aged 15–54 years with proper knowledge about HIV/AIDS between provinces. Considering the fact that education directly benefits women and their children and also is a main determinant of health services utilization, well-being, and health outcome,,,, it can be implied that disparity in it could be considered the main cause for disparity in women's health outcomes in Iran. In other researches, it was asserted that women in many (developed and developing) countries have less access to education. Young women almost constitute more than 60% of 15–24-year olds living with HIV/AIDS. In Iran, the prevalence and mortality rate of HIV/AIDS were 93 and 6 per 100,000 populations in 2012, respectively. At least 50% of which were women. The provincial distribution of HIV mortality and morbidity was not available for more analysis, but it could be said that the disparity in proper knowledge about HIV/AIDS might be the reason behind the disparity in HIV/AIDS morbidity. Preventive interventions such as education are viewed as the best strategy for controlling the growth of AIDS. However, in the current study, disparity in health knowledge proxies by knowledge about HIV/AIDS estimate very high. Furthermore, the female population with proper knowledge about HIV/AIDS in the country is less than one-third of the total population. The findings showed an unsatisfactory situation of overall rate and distribution of health knowledge among Iranian women. Thus, policymakers should pay attention to promoting education, particularly health education in provinces such as Sistan and Balouchestan, Western Azarbayejan, Kohkiloyeh and Boyerahmad, Ardebil, Northern Khorasan, and Hormozgan, which are very disadvantageous (lower than one forth) among others. In women's roles in reproduction and production, the findings indicate moderate disparity for the percentage of women aged 15–24 years with no job and the percentage of women aged 15–24 years with no income between the provinces. Employment and income are the key SDH.,, As shown in other studies, poorer people received less maternal health care from an SBA., The overall rate of women aged 15–24 years with no job and women aged 15–24 years with no income is high (about 90%), which may be related to cultural and social factors concerning women's employment in Iran. These factors are completely irrelevant to the health-care system, and improving them requires an inter-sectoral planning in the country. Further studies have shown that women's education and wealth status contribute greatly to maternity-care services utilization. As concluded by Moss, these factors mediate social, economic, and cultural effects on health outcomes. Indicators of this section are encompassed in three parts including accessibility to media and a computer or the internet, utilization of professional health providers, and high-risk behaviors. Most regional disparities were related to high-risk behaviors including smoking and hookah use among women aged 15–54 years. For nearly one-third of the regions, smoking and hookah use fall short of the population averages. The disparity with respect to health-related risk behaviors is very striking. Furthermore, there were remarkable differences in delivery by an SBA and pregnancy care by an SBA. A study in Namibia also showed that there was remarkable disparity in delivery by skilled health providers among different geographical regions. Other studies also proved that there is inequality in maternal health-care services. There is a negative relationship between delivery by SBA and maternal mortality rate. Thus, it is necessary that all interventions are concentrated in regions with fewer deliveries by SBAs. It was also observed that there are regional disparities in access to at least one type of mass media and computers or internet among women 15–24 years of age. Health outcomes are the main goal of any health system. Disparity in health outcomes is a key and final part of evaluation of a broad equity concept in health systems. In the current study, due to limitation in data availability, women's health outcome was limited to “women aged 15–54 years with at least one chronic disease” and “crude death rate of women.” Disparities in these indicators were also noticeable. Bushehr province had the highest ratio of women aged 15–54 years with at least one chronic disease. These chronic diseases included diabetes, joint, skin, asthma, and coronary diseases. Moreover, this province also had the highest ratio of consumption of hookah and smoking, which are two of the most common risk factors for noncommunicable diseases. These results support the correlation of disparity in smoking and chronic disease in women among provinces. A review study  concluded that hookah consumption is possibly associated with respiratory illness. Moreover, many studies also showed that tobacco smoking is associated with an increased risk of type 2 diabetes  and asthma. Although inequality in women's death in 2011 was decreased compared to 2010, it still showed considerable disparity among the regions. Considering the interrelationship of factors influencing women's health in Moss's framework, it can be concluded that health-related mediators and sociodemographic characteristics/education had the most disparities among different regions at the country level which might exacerbate the inequality in health outcomes of women in Iran. Second, our analysis of disparities was based on aggregate data for the female population at the provincial level. Notwithstanding, this analysis addresses that area or place effect  has some implications regarding women's health disparities among provinces; however, it does not measure the disparities within provinces and other population subgroups. Therefore, it is necessary that future research is focused on disparities among female population subgroups using individual data to eliminate avoidable disparities through appropriate effort and resource reallocation. Third, some indicators such as women aged 15–54 years with at least one chronic disease were based on self-report data. This indicator might be faced with underestimate bias. Moreover, areas with better socioeconomic status and therefore, greater self-consciousness might overestimate this indicator. In a study conducted on data of DHS, it was shown that the education level of mothers is negatively associated with child mortality and positively associated with reported child morbidity. This positive relationship between socioeconomic level and reported morbidity was a result of recall and reporting bias among mothers in lower socioeconomic classes. For this reason, the present study showed that some provinces with lower socioeconomic levels compared to higher ones had higher rate of reported morbidity for chronic diseases. Considering the recall and reporting bias in reported morbidity data, it might be concluded that prevalence of chronic diseases among women in some provinces, particularly Bushehr province, might be higher than what has been reported. Hence, disparities in this outcome are most likely worse than the Gini coefficient has shown. Considering the limitations of the present study and the need for sound evidence on disparities in women's health, it is be suggested that the following issues be addressed in future studies: (a) analysis of inequalities in women's health using individual data, (b) applying other techniques for inequality measurement to obtain more robust results, (c) a comparison of inequalities in health determinants between men and women, (d) use of more valid indicators in inequality measurement of health outcomes. In this study, we examined the provincial disparities in health determinants and outcomes of women based on Moss's framework among Iranian women. Disparity in five categories including “geopolitical environment,” “culture, norms, sanctions,” “women's roles in reproduction and production,” “health-related mediators,” and “health outcome” was analyzed. Determinants of women's health included cigarette smoking, hookah consumption, knowledge about HIV/AIDS, utilization of internet or computer, pregnancy care by the SBA, and delivery by SBA had the highest provincial disparity among other factors. In conclusion, it can be asserted that provincial disparities in health determinants and outcome of women are related to the biggest and most critical situations related to factors such as lifestyle, health behavior, health knowledge, and health-care services availability and decision and should therefore be considered by policymakers when in the course of policymaking and planning. As noted by the World Health Organization, the data on women's health are inadequate and often unreliable for policy making, particularly in developing countries. Therefore, this study can be considered one of the few published studies on inequity of Iranian women's health. Our study presents a comprehensive framework for assessing inequality in women's health at the regional level, particularly for developing countries. Davidson PM, McGrath SJ, Meleis AI, Stern P, Digiacomo M, Dharmendra T, et al. The health of women and girls determines the health and well-being of our modern world: A white paper from the International Council on Women's Health Issues. Health Care Women Int 2011;32:870-86. Sankaran G. From alma-ata to millennium development goals: Status of women's health in the 21st century. In: Padmini Murthy CL, editor. Women's Global Health and Human Rights. Burlington: Jones and Bartlett Publishers; 2010. p. 519-32. World Health Organization. Women and Health: Today's Evidence Tomorrow's Agenda. Geneva:World Health Organization; 2009. Bobbitt-Zeher D. The gender income gap and the role of education. Sociol Educ 2007;80:1-22. Marmot M, Friel S, Bell R, Houweling TA, Taylor S; Commission on Social Determinants of Health. Closing the gap in a generation: Health equity through action on the social determinants of health. Lancet 2008;372:1661-9. Morris S, Devlin N, Parkin D. Economic Analysis in Health Care. Chichester: John Wiley and Sons; 2007. Adler NE, Rehkopf DH. U.S. disparities in health: Descriptions, causes, and mechanisms. Annu Rev Public Health 2008;29:235-52. Collins FS. What we do and don't know about 'race', 'ethnicity', genetics and health at the dawn of the genome era. Nat Genet 2004;36 11 Suppl: S13-5. Sondik EJ, Huang DT, Klein RJ, Satcher D. Progress toward the healthy people 2010 goals and objectives. Annu Rev Public Health 2010;31:271-81. Hajizadeh M, Connelly LB, Butler JR. Health policy and horizontal inequities of health-care utilization in Australia: 1983-2005. Appl Econ Lett 2012;19:1765-75. Kavosi Z, Rashidian A, Pourreza A, Majdzadeh R, Pourmalek F, Hosseinpour AR, et al. Inequality in household catastrophic health care expenditure in a low-income society of Iran. Health Policy Plan 2012;27:613-23. Abasolo I, Manning R, Jones AM. Equity in utilization of and access to public-sector GPs in Spain. Appl Econ 2001;33:349-64. Ahmad Kiadaliri A, Najafi B, Haghparast-Bidgoli H. Geographic distribution of need and access to health care in rural population: An ecological study in Iran. Int J Equity Health 2011;10:39. Ameryoun A, Meskarpour-Amiri M, Dezfuli-Nejad ML, Khoddami-Vishteh H, Tofighi SH. The assessment of inequality on geographical distribution of non-cardiac intensive care beds in iran. Iran J Public Health 2011;40:25-33. Hosseinpoor AR, Mohammad K, Majdzadeh R, Naghavi M, Abolhassani F, Sousa A, et al. 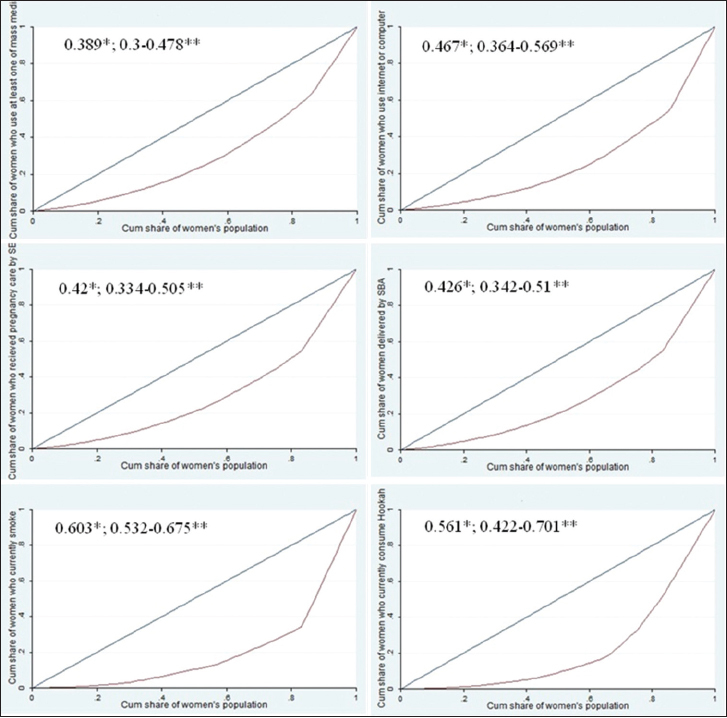 Socioeconomic inequality in infant mortality in Iran and across its provinces. Bull World Health Organ 2005;83:837-44. Sepehrdoust H. Eliminating Health Disparities Call to Action in Iran. Int J Appl Econ Finan 2009;3:22-34. Moss NE. Gender equity and socioeconomic inequality: A framework for the patterning of women's health. Soc Sci Med 2002;54:649-61. Rico E, Fenn B, Abramsky T, Watts C. Associations between maternal experiences of intimate partner violence and child nutrition and mortality: Findings from Demographic and Health Surveys in Egypt, Honduras, Kenya, Malawi and Rwanda. J Epidemiol Community Health 2011;65:360-7. Sreeramareddy C, Shidhaye R, Sathiakumar N. P2-476 association between maternal exposure to biomass smoke and birth weight: An analysis of 2005-2006 India demographic health survey data. J Epidemiol Community Health 2011;65 Suppl 1: A352-3. Awan S. SP5-8 Tuberculosis-major killer of adult urban women: Demographic and health survey (DHS) from Pakistan. J Epidemiol Community Health 2011;65 Suppl 1: A447. Khan U, Hashmi A, Zia N, Awan S, Razzak J. P2-520 injury-related mortality among women aged 12-49 years: Demographic and health survey (DHS) Pakistan. J Epidemiol Community Health 2011;65 Suppl 1: A364-5. Montagu D, Yamey G, Visconti A, Harding A, Yoong J. Where do poor women in developing countries give birth? A multi-country analysis of demographic and health survey data. PLoS One 2011;6:e17155. Ochako R, Fotso JC, Ikamari L, Khasakhala A. Utilization of maternal health services among young women in Kenya: Insights from the Kenya Demographic and Health Survey, 2003. BMC Pregnancy Childbirth 2011;11:1. Anwar I, Sami M, Akhtar N, Chowdhury M, Salma U, Rahman M, et al. Inequity in maternal health-care services: Evidence from home-based skilled-birth-attendant programmes in Bangladesh. Bull World Health Organ 2008;86:252-9. Zere E, Tumusiime P, Walker O, Kirigia J, Mwikisa C, Mbeeli T. Inequities in utilization of maternal health interventions in Namibia: Implications for progress towards MDG 5 targets. Int J Equity Health 2010;9:16. Baker D, Middleton E. Cervical screening and health inequality in England in the 1990s. J Epidemiol Community Health 2003;57:417-23. Luchenski S, Quesnel-Vallée A, Lynch J. Differences between women's and men's socioeconomic inequalities in health: Longitudinal analysis of the Canadian population, 1994-2003. J Epidemiol Community Health 2008;62:1036-44. McLellan DL, Kaufman NJ. Examining the effects of tobacco control policy on low socioeconomic status women and girls: An initiative of the tobacco research network on disparities (TReND). J Epidemiol Community Health 2006;60 Suppl 2:ii5-6. Pathak PK, Singh A, Subramanian SV. Economic inequalities in maternal health care: Prenatal care and skilled birth attendance in India, 1992-2006. PLoS One 2010;5:e13593. Falkingham J. Inequality and changes in women's use of maternal health-care services in Tajikistan. Stud Fam Plann 2003;34:32-43. Teruya C, Longshore D, Andersen RM, Arangua L, Nyamathi A, Leake B, et al. Health and health care disparities among homeless women. Women Health 2010;50:719-36. Rashidian A, Karimi-Shahanjarini A, Khosravi A, Elahi E, Beheshtian M, Shakibazadeh E, et al. Iran's multiple indicator demographic and health survey – 2010: Study protocol. Int J Prev Med 2014;5:632-42. Rashidian A, Khosravi A, Khabiri R, Khodayari-Moez E, Elahi E, Arab M, et al. Islamic Republic of Iran's Multiple Indicator Demographic and Health Survey. (IrMIDHS). 2010. Tehran: Ministry of Health and Medical Education; 2012. Report of Vital Statistics Events for 2010 and 2011 Years; 2011. Available from: https://www.sabteahval.ir/en/. [Last accessed on 2014 Dec 24]. Census; 2011. Available from: http://www.salnameh.sci.org.ir/AllUser/DirectoryTreeComplete.aspx. [Last accessed on 2015 Feb 16]. Berndt DJ, Fisher JW, Rajendrababu RV, Studnicki J. Measuring healthcare inequities using the Gini index. InSystem Sciences, 2003. Proceedings of the 36th Annual Hawaii International Conference; 2003. p. 10. Horev T, Pesis-Katz I, Mukamel DB. Trends in geographic disparities in allocation of health care resources in the US. Health Policy 2004;68:223-32. Le Grand J. Inequalities in health: Some international comparisons. Eur Econ Rev 1987;31:182-91. De Maio FG. Income inequality measures. J Epidemiol Community Health 2007;61:849-52. Kahneman D, Krueger AB. Developments in the measurement of subjective well-being. J Econ Perspect 2006;20:3-24. Bayati M, Akbarian R, Kavosi Z. Determinants of life expectancy in eastern mediterranean region: A health production function. Int J Health Policy Manag 2013;1:57-61. Yazdi Feyzabadi V, Haghdoost A, Mehrolhassani MH, Aminian Z. The association between peace and life expectancy: An empirical study of the world countries. Iran J Public Health 2015;44:341-51. Grown C, Gupta GR, Pande R. Taking action to improve women's health through gender equality and women's empowerment. Lancet 2005;365:541-3. Lavin AT, Shapiro GR, Weill KS. Creating an agenda for school-based health promotion: A review of 25 selected reports. J Sch Health 1992;62:212-28. World Health Organization. World Health Statistics 2014. Geneva, Switzerland: World Health Organization; 2014. Fayissa B, Gutema P. Estimating a health production function for Sub-Saharan Africa (SSA). Appl Econ 2005;37:155-64. Kabir M. Determinants of life expectancy in developing countries. J Dev Areas 2008;41:185-204. Lin SJ. Economic fluctuations and health outcome: A panel analysis of Asia-Pacific countries. Appl Econ 2009;41:519-30. Kamal SM. Factors affecting utilization of skilled maternity care services among married adolescents in Bangladesh. Asian Popul Stud 2009;5:153-70. Babalola S, Fatusi A. Determinants of use of maternal health services in Nigeria – Looking beyond individual and household factors. BMC Pregnancy Childbirth 2009;9:43. World Health Organization. The World Health Report: 2000: Health Systems: Improving Performance. Geneva: World Health Organization; 2000. Willi C, Bodenmann P, Ghali WA, Faris PD, Cornuz J. Active smoking and the risk of type 2 diabetes: A systematic review and meta-analysis. JAMA 2007;298:2654-64. Pietinalho A, Pelkonen A, Rytilä P. Linkage between smoking and asthma. Allergy 2009;64:1722-7. Regidor E. Measures of health inequalities: Part 1. J Epidemiol Community Health 2004;58:858-61. Kawachi I, Subramanian SV, Almeida-Filho N. A glossary for health inequalities. J Epidemiol Community Health 2002;56:647-52. Regidor E. Measures of health inequalities: Part 2. J Epidemiol Community Health 2004;58:900-3. Manesh AO, Sheldon TA, Pickett KE, Carr-Hill R. Accuracy of child morbidity data in demographic and health surveys. Int J Epidemiol 2008;37:194-200.